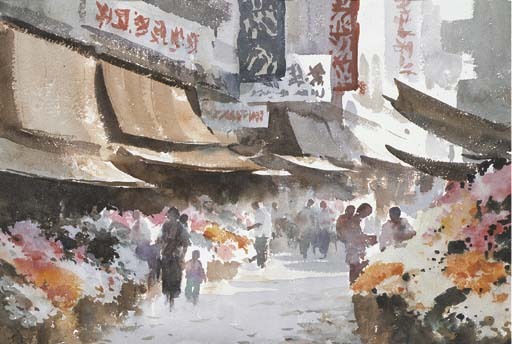 R. Ranson, Edward Seago, London, 1987, p. 65, illustrated. In 1962 Seago accepted an invitation from John Kidston Swire, chairman of a far eastern trading and shipping group, to visit Hong Kong and paint pictures for the boardroom of their branch there. James Reid (Edward Seago, The Landscape Art, London, 1991, p. 230) writes: 'On Hong Kong Island, Seago explored the northern waterfront of Wan Chai, and then strolled west with sketchbook in hand ... Although he was dismayed by the crowding and poverty, he was captivated by the maze of congested streets pulsating with strange sounds, sights and smells, the jostling crowds and ornate calligraphy of Chinese pictographic symbols' and concludes that 'with the exception of such artists as Sir Gerald Kelly and George Chinnery, few British painters have essayed the challenging task of the Orient'.